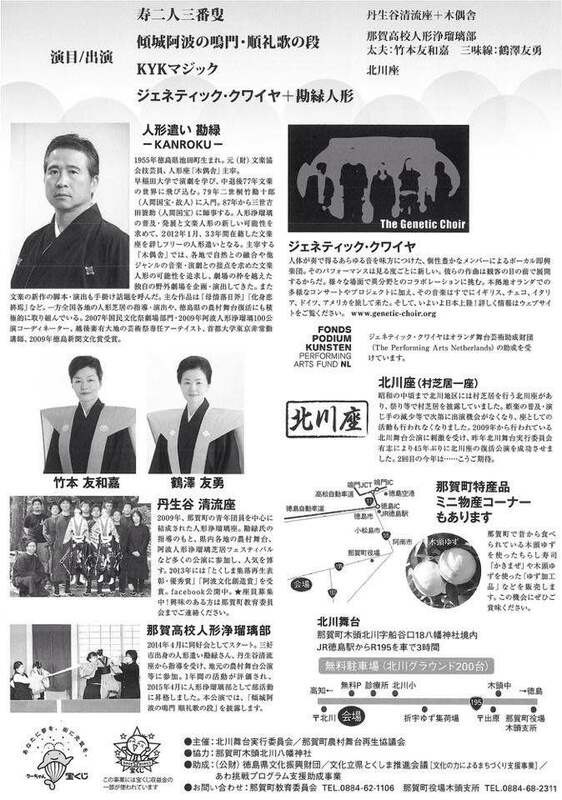 The Genetic Choir Ensemble is set to travel to Japan in September this year, to first perform on the Creative Music Festival 2016 in Hiroshima, and afterwards join Bunraku company Mokugu-sha on a small tour in Tokushima prefecture. 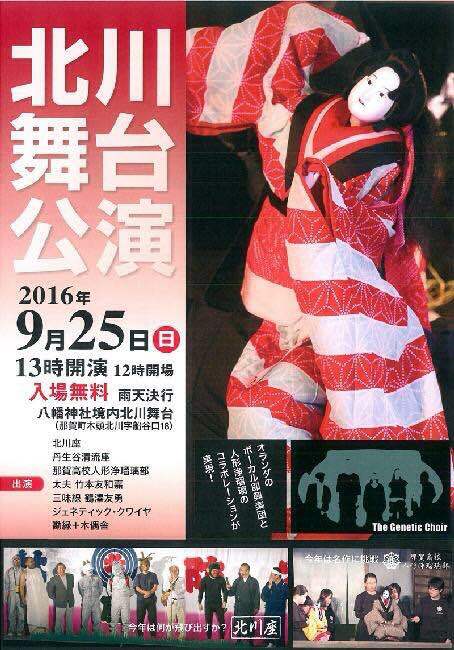 Performances in Japan will be on 18/19 September and 22/25 September 2016. 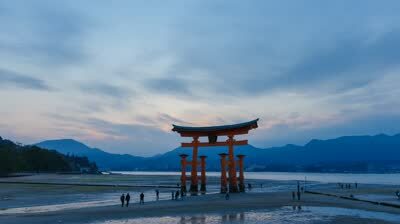 The Genetic Choir has been invited to be guest artist on CMF – Creative Music Festival in Hiroshima in 2016 ! We would love to accept this beautiful invitation and are now working on extending our tour and forging musical collaborations in other Japanese cities so that a working visit of the Genetic Choir to Japan next year becomes feasible. Please let us know if you know of people/sponsors who could help make this happen, or if you know of other contemporary music contacts in Japan that we could approach to offer concerts and/or workshops. The Creative Music Festival (CMF) is a music festival that has been held in Japan every year since 1998. In past editions, more than 40 guest artists were invited from all over the world to give experimental workshops and concerts. Past guest artists are active in the international forefront, and included the improvising musicians Urs Leimgruber, Carl Bergstroem-Nielsen, Godfried-Willem Raes, Joelle Leandre, Trevor Wishart, Michael Fischer, Makoto Nomura, Koichi Makigami, Yoshihide Otomo, Tomomi Adachi, Akio Suzuki, Dora Video, the improvisation actress Yuri Kinugawa, the artists Tetsuya Umeda, Horio Kanta, etc. As a music festival CMF focuses on the relationship between music and various adjacent fields – body expression and theatre, fine art, sound art, sociology, etc. Participants therefore come from a wide range of fields: professional musicians, music teachers, amateur musicians, artists, dancers, music therapists, etc. The composer Yu Wakao organized the festival until CMF2008; since CMF2009 it has been organized by the composer and improviser Daisuke Terauchi.